AMC Theatres wants you to enter once for the chance to win an exciting getaway vacation for four to BROADWAY to see "Charlie And The Chocolate Factory"! 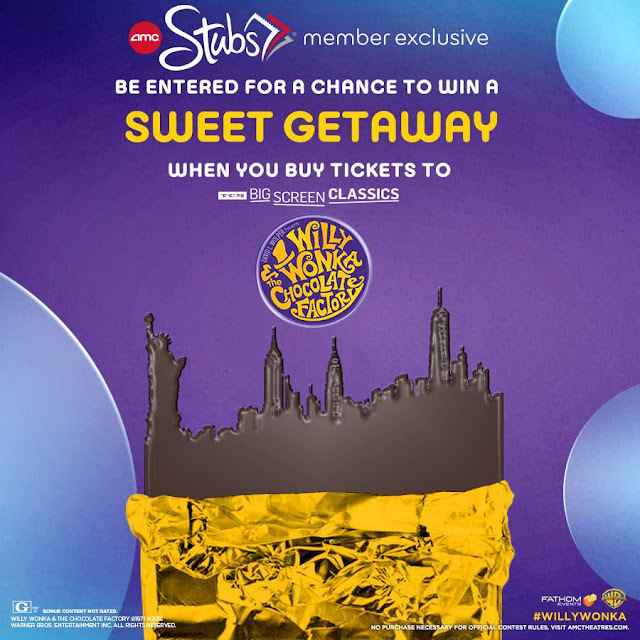 Winner will receive a trip for winner and three (3) guests to New York City to be among the first to see the new Broadway production of “Charlie and the Chocolate Factory” on stage! The “Prize” includes: four (4) tickets to CHARLIE AND THE CHOCOLATE FACTORY on Broadway (Value $600), two (2) night stay at a hotel in NYC (Value $2,000), four (4) roundtrip flights on American Airlines to NYC (Up to value $2,500 – provided in flight vouchers. T+C apply) and dinner for four (4) at Sugar Factory (Value $300). Approximate Retail Value (“ARV”) of the Prize: $4,999. This Sweepstakes ends on 06/29/16 and you can ENTER ONCE to win.